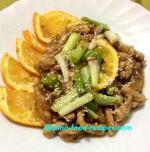 This Bicol Express recipe packs a lot of heat and is not 'for the faint of heart'. This fiery dish is made with coconut milk, shrimp paste and a whole bunch of long green chili peppers. My friend from the Bicol province where it is said to have originated says they sometimes omit the pork and use only the peppers...wow! The heat of the chili pepper is in its seeds and ribs, so I suggest to take them out when you're prepping, then just add them towards the end to get the desired heat. 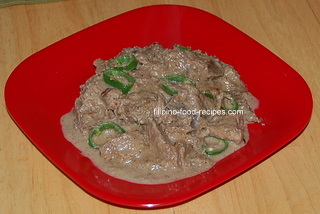 My bicol express recipe is a milder version. I like hot and spicy dishes but I want to be able to appreciate the flavors in the dish, and not mask it with heat. For a real mild version of the dish, check out my Cook's Tips at the end of this page. On the other hand, if you are a-tapang-a-tao(a brave fellow) and would not have it any other way, go ahead and add as many chilies as you want, including the seeds and the ribs. 1 Heat oil, saute the garlic and onion and ginger, and half of the chili peppers. 2 Add in the cubed pork and shrimp paste and saute for 2 minutes. 3 Add the coconut milk, stir until it boils. 4 Turn down the heat to simmer, stirring occasionally, until half the liquid is evaporated, about 15 minutes. 5 Stir in the rest of the chili peppers, and continue simmering until the meat is tender and coconut milk has rendered fat, about 10 minutes. 6 Add salt and pepper to taste. Adjust the heat if it's not hot enough, by adding the seeds that you removed from the peppers. For those who don't mind eating a chunk of ginger, you can just cut it into strips instead of shredding it. When buying coconut milk, look for one with 0(zero) sugar content on its Nutrition label. You don't want a hint of sweetness for this dish. You don't have to suffer from a very hot and spicy Bicol Express if you can't handle the heat. If you like the dish but can't withstand the powerful heat, use just one or two chili peppers (seeds and ribs removed) stirred in during the last few minutes of the cooking process. Very Important! Make sure you wash your hands (and the knife and cutting board) right after handling the chili otherwise your hand will feel a severe burning sensation that's very uncomfortable, and sometimes really painful.